On Tuesday, Feb. 5., Merrill Krabill, professor of art at Goshen College and the department chair, delivered the 2019 C. Henry Smith Peace Lecture. In Krabill’s lecture, titled, “A Visual Reflection on Fear and Connection,” he reflected on the topic of fear, often asking the audience,“How do we live with fear?” Drawing from the work of other scholars, artists, and personal experiences, Krabill shared how he has learned to view fear in a different way. The lecture is named after C. Henry Smith who was a distinguished Mennonite historian who taught at Goshen College from 1908 to 1913. Every year, a research grant is awarded to a scholar at a Mennonite College to prepare and present a lecture. C. Henry Smith was known for strengthening and maintaining the peace witness in Mennonite churches. This lectureship gives the lecturer and their community opportunities to reflect, strengthen, and teach peace. As an artist, Krabill’s current artwork is not only an evolution of previous artwork, but also of his way of thinking about fear. He now recognizes the importance of finding and nurturing connections in times of fear and suffering. “To live well in the face of fear, you need to find a friend,” said Krabill. It is by looking at the connections in and with others and nurturing those connections that we can learn to face fear. He shared that raw suffering can lead to different outcomes: rage or inner reflection. Krebill also said that learning how to face fear and suffering was process that took a lot of time and reflection. Life is a like cycle of loss and redemption. 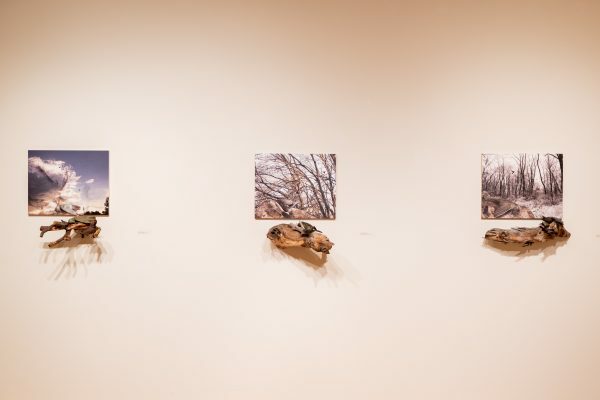 Through his own process of inner reflection, Krabill has come to understand and agree with the idea that through suffering we become humans and learn how to understand the layers of connections that surround us. Krabill’s reflection on fear and connection was accompanied by a series of art pieces composed of wood, clay birds, and printed images. 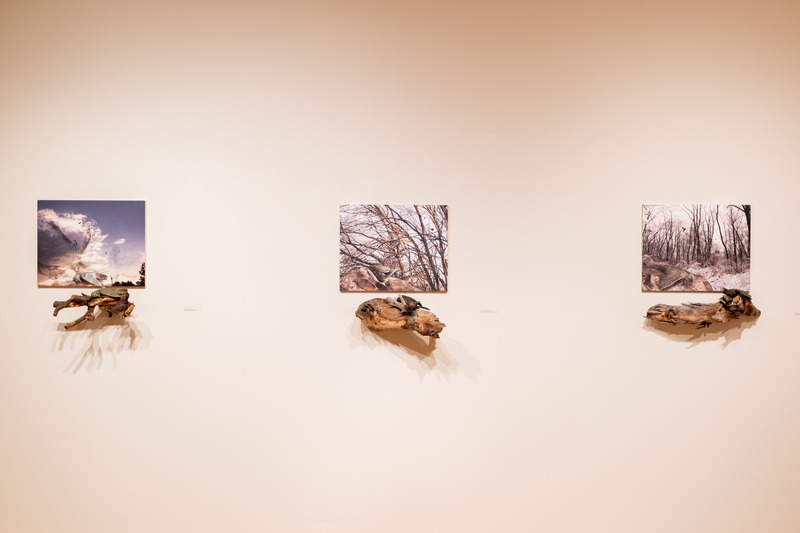 These pieces are currently on display in the Hershberger gallery. Krebill’s art explores the contrasting ideas of life and death, beauty and suffering, which is meant to generate questions and not answers among viewers. As the artist, Krabill often likes to ask viewers, “What do you see?” because every interpretation is valuable. Seeing and nurturing connections is the heart of his artwork. 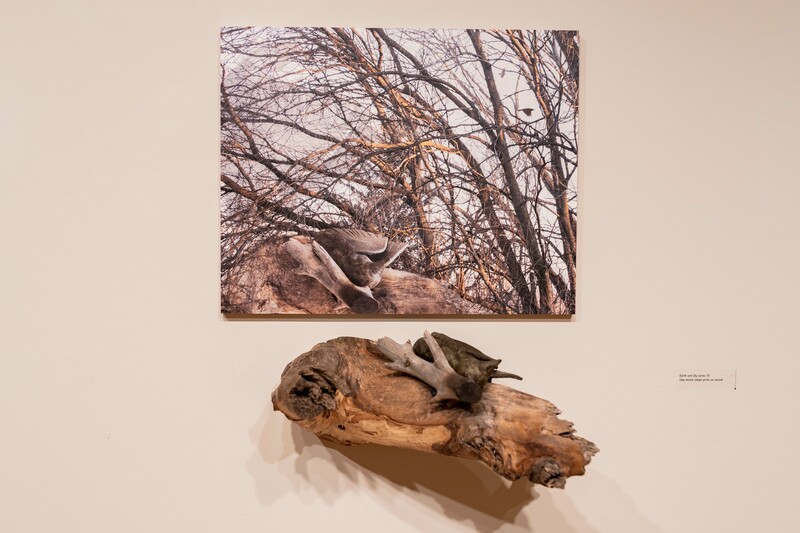 Each of his pieces has a clay bird laying on a piece of wood with a printed image on a wooden canvas as the background. 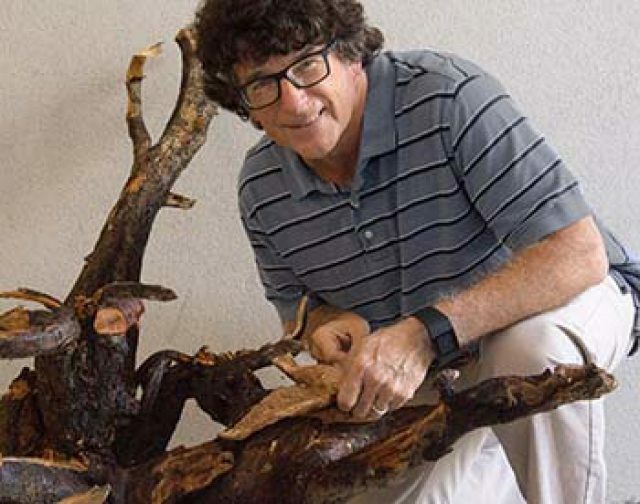 In Krabill’s mind both the wood and birds are dead, but his art is up to the interpretation of viewers. 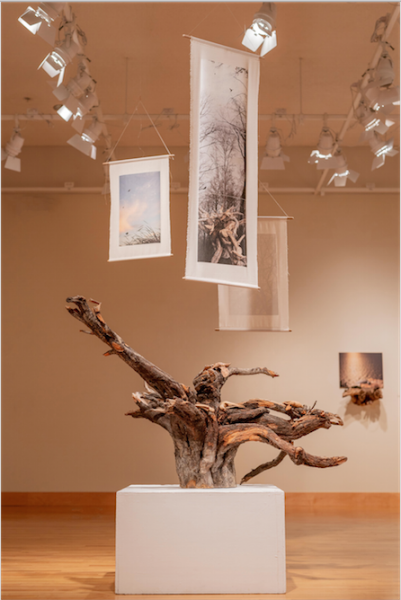 Whether his art evokes feelings of peace or suffering, the interpretations viewers make allows them to engage in the process of finding connections that led to a certain feeling or perspective. At the end of the lecture, Krabill encouraged the audience to use their personal stories and life experiences to ask questions and find connections in what may seem to be contrasting or troubling concepts. Learning how to live in the face of fear may be a long and thoughtful process for some, but as Krabill suggested, finding a friend and making connections may change how we do this.